Researchers identify new genetic variants in Hirschsprung’s disease development. Genetic studies in humans, zebrafish and mice have revealed how two different types of genetic variations team up to cause a rare condition called Hirschsprung’s disease. The findings from Johns Hopkins University add to an increasingly clear picture of how flaws in early nerve development lead to poor colon function, which must often be surgically corrected. The study also provides a window into normal nerve development and the genes that direct it. The opensource study is published in the American Journal of Human Genetics. The team state that about one in every 5,000 babies is born with Hirschsprung’s disease, which causes bowel obstruction and can be fatal if not treated. The disease arises early in development when nerves that should control the colon fail to grow properly. Those nerves are part of the enteric nervous system that governs the function of the gastrointestinal system. The enteric nervous system communicates with the central nervous system and can operate autonomously, which is why it is often called the ‘second brain’. The genetic causes of Hirschsprung’s disease are complex, making it an interesting case study for researchers. The research group took on the condition in 1990, and in 2002, it performed the first-ever genome-wide association study to identify common variants linked to the disease. But while the medical community have identified several genetic variants associated with Hirschsprung’s, those variants do not explain most cases of the disease. So the team have conducted a new genome-wide association study of the disease, comparing the genetic markers of more than 650 people with Hirschsprung’s disease, their parents and healthy controls. One of their findings was a variant in a gene called Ret that had not been previously associated with the disease, although other variations in Ret had been identified as culprits. The current study also found a variant near genes for several so-called semaphorins, proteins that guide developing nerve cells as they grow toward their final targets. Through studies in mice and zebrafish, the researchers found that the semaphorins are indeed active in the developing enteric nervous system, and that they interact with Ret in a system of signals called a pathway. It looks like the semaphorin variant doesn’t by itself lead to Hirschsprung’s, the team explain, but when there’s a variant in Ret too, it causes the pathway to malfunction and can cause disease. The current study has found a new pathway that guides development of the enteric nervous system, one that nobody suspected had this role. The team note that the genetic puzzle of Hirschsprung’s is still missing some pieces, and no clinical genetic test yet exists to assess risk for the disease. The researchers surmise that most of the genetic variants that have so far been connected to this rare disease are themselves relatively common and are associated with less severe forms of the disease. The hunt continues for rare variants that can explain more severe cases. in the developing mouse gastrointestinal tract relative to Ret. 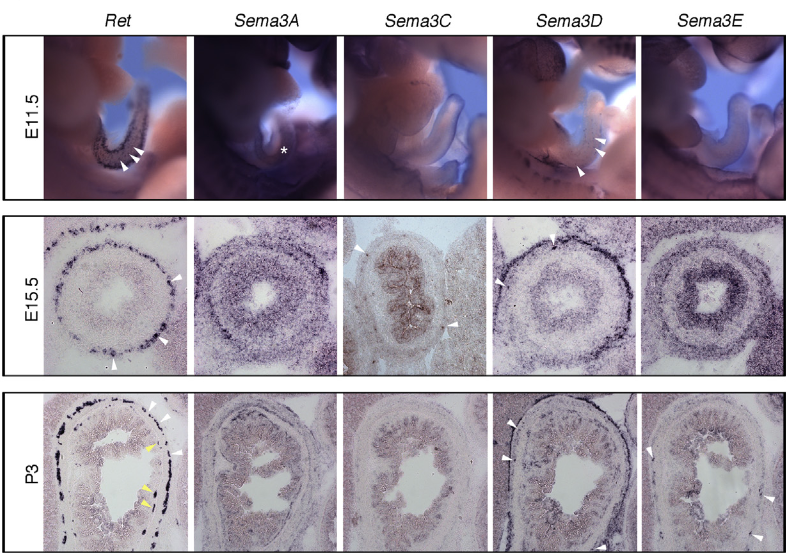 Expression analysis is shown for Ret, Sema3A, Sema3C, Sema3D, and Sema3E in the developing gut at stage E11.5, in E15.5 intestine sections, and in P3 intestine sections. Functional Loss of Semaphorin 3C and/or Semaphorin 3D and Their Epistatic Interaction with Ret Are Critical to Hirschsprung Disease Liability. Chakravarti et al 2015.